In cabinetwork, the counters and tops are covered with a 1/16-inch layer of high-pressure plastic laminate. Although this material is very hard, it does not possess great strength and is serviceable only when it is bonded to plywood, particle board, or wafer wood. This base, or core material, must be smooth and is usually 3/4-inch thick. Plastic laminates can be cut to rough size with a table saw, portable saw, or saber saw. Use a fine-tooth blade, and support the material close to the cut. If no electrical power is available, you can use a finish handsaw or a hacksaw. When cutting laminates with a saw, place masking tape over the cutting area to help prevent chipping the laminate. Make cut markings on the masking tape. Measure and cut a piece of laminate to the desired size. Allow at least 1/4-inch extra to project past the edge of the countertop surface. Next, mix and apply the contact bond cement to the underside of the laminate and to the topside of the countertop surface. Be sure to follow the manufacturer's recommended directions for application. Allow the contact bond cement to set or dry. To check for bonding, press a piece of waxed brown paper on the cement-coated surface. When no adhesive residue shows, it is ready to be bonded. Be sure to lay a full sheet of waxed brown paper across the countertop. This allows you to adjust the laminate into the desired position without permanent bonding. Now, you can gradually slide the paper out from under the laminate, and the laminate becomes bonded to the countertop surface. Be sure to roll the laminate flat by hand, removing any air bubbles and getting a good firm bond. After sealing the laminate to the countertop surface, trim the edges by using either a router with a special guide or a small block plane. If you want to bevel the countertop edge, use a mill file. LEARNING OBJECTIVE: Upon completing this section, you should be able to identify the different types of fastening devices. A variety of metal fastening devices are used by Seabees in construction. Although nails are the most commonly used fastener, the use of staples to attach wood structural members is growing. For certain operations, screws and bolts are required. In addition, various metal devices exist for anchoring materials into concrete, masonry, and steel. The increasing use of adhesives (glues and mastics) is an important development in the building industry. Adhesives are used in combination with, or in place of, nails and screws. Nails, the most common type of metal fasteners, are available in a wide range of types and sizes. Some basic types are shown in figure 3-75. The common nail is designed for rough framing. The box nail is used for toenailing and light work in frame construction. The casing nail is used in finished carpentry work to fasten doors and window casings and other wood trim. The finishing nail and brad are used for light, wood-trim material and are easy to drive below-the surface of lumber with a nail set. 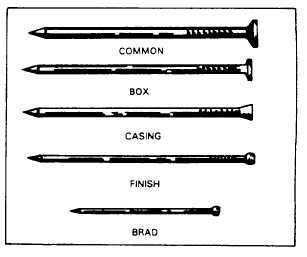 Figure 3-75.-Basic types of nails.